Able Software R2V for Windows, is a powerful raster to vector conversion software at a reasonable price. R2V combines the power of intelligent automatic vectorizing technology with an easy-to-use, menu-driven, graphical user interface in the Microsoft Windows environment. 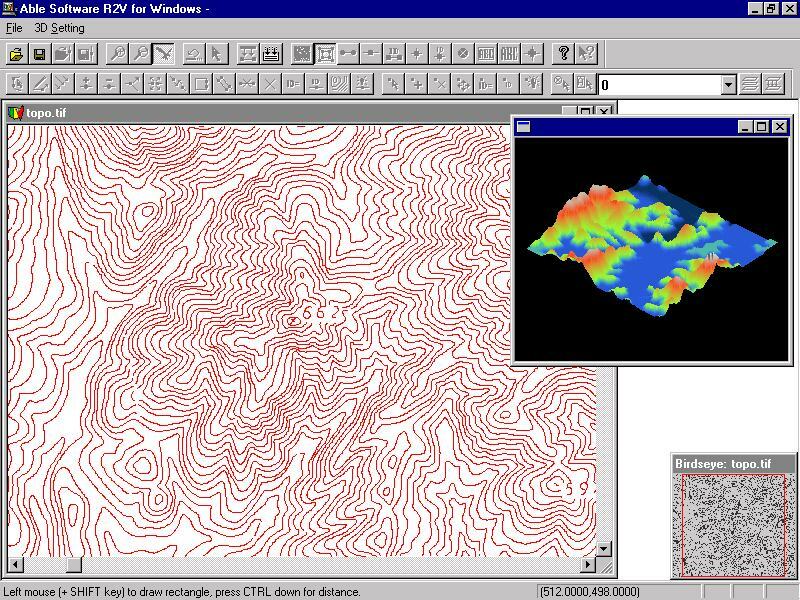 The software converts scanned maps or images to vector formats for mapping, geographic information systems (GIS), CAD, and scientific computing applications. The system is easy to use and can be learned quickly by users with any level of technical background. R2V provides an easy and complete solution to digitize vector data from image sources, such as scanned maps and drawings, aerial photos, and satellite imagery. For many images, the entire raster to vector conversion process is fully automatic and needs no human intervention. You display the scanned image on screen and you select the vectorization command. That is all it takes! All the lines are extracted in seconds and displayed right on top of the image for you to verify and edit. Powerful editing and processing functions are provided to edit, geo-reference, and label your data. R2V has all the tools to get a perfect set of vector data faster and easier than any other methods. With R2V, you can forget about slow and inaccurate hand tracing on a digitizing tablet, simply scan your map or drawing and let R2V vectorize it automatically, at a high accuracy level. 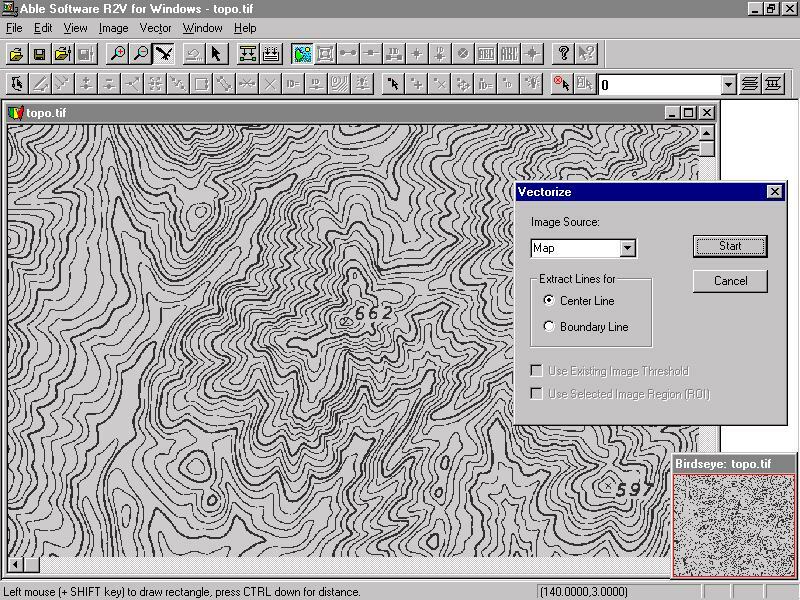 A typical contour or parcel map scanned at 200 DPI (dots/inch) as black and white or grayscale can be vectorized in seconds or minutes on a Pentium PC. The image is vectorized using R2V's fully automatic vectorization function. A 3D DEM is also created from the labeled contour lines and displayed using R2V's 3D functions. We know editing for both raster images and vector data is extremely important to you, so we have made the effort to build easy to use and intelligent editors for you to handle all data types in one display window, including lines, points, polygons, text labels, image pixels, and control points. With R2V, you can automatically vectorize maps or drawings, perform quick heads-up digitizing and geo-referencing of aerial photos or satellite imagery, and update your existing vector data sets using the latest aerial photos or other images. You have some color maps? No problem. Scan them in color and R2V will classify the colors and vectorize each color separately; Then label the lines using the semi-automatic vector labeling tools. Whether your maps are contours, parcels, transportation, or CAD drawings, or if you have hundreds or thousands of them, R2V is the right tool for you because it is being used all over the world for all types of large and small digitizing projects. Our users have been impressed by how easy and how fast the digitizing job has become and the prompt technical support we have provided. And what about remote sensing? 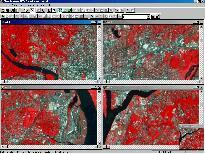 SPOT satellite image format is supported. 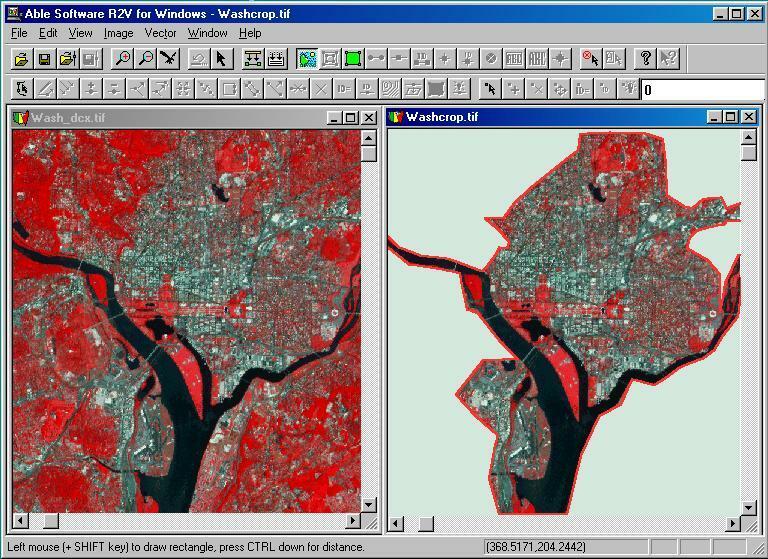 Natural source images, such as aerial photos and color satellite images, can be automatically classified or segmented to generate region or boundary maps, all in R2V. Advanced image processing functions include image warp or registration, image mosaic, color classification and separation, and many more to handle different types of images. 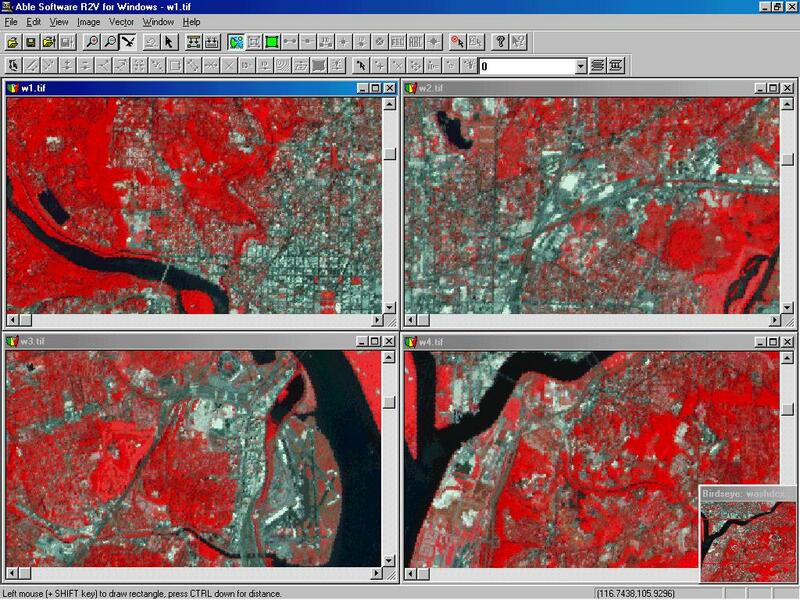 If you need to update your existing vector data set using the latest satellite image or other source, simply load the image into R2V and import your vector data set. With R2V's powerful editing functions, you can easily update your data, label your data, and geo-reference your data so your data is almost immediately ready for use. If you provide digitizing or data conversion services to your clients, R2V will help you to get the job done quicker and better than manual tracing or other poor quality conversion programs. Not only does R2V have the best fully automatic and semi-automatic tracing functions, but all the tools you can use to edit both raster and vector data, assign labels, geo-reference, and create a 3D display of your data. Have too many maps or drawings to convert? R2V's batch processing function is the solution for you. First write your image and vector processing script using R2V's script editor, and then list all your images. Whether you have 50 or 500 of them, one command will process them all, with all the pre-processing and post-processing steps applied and the vector data saved. Image Formats: TIFF, GeoTIFF, JPEG, GIF, RLC, PNG and BMP formats. 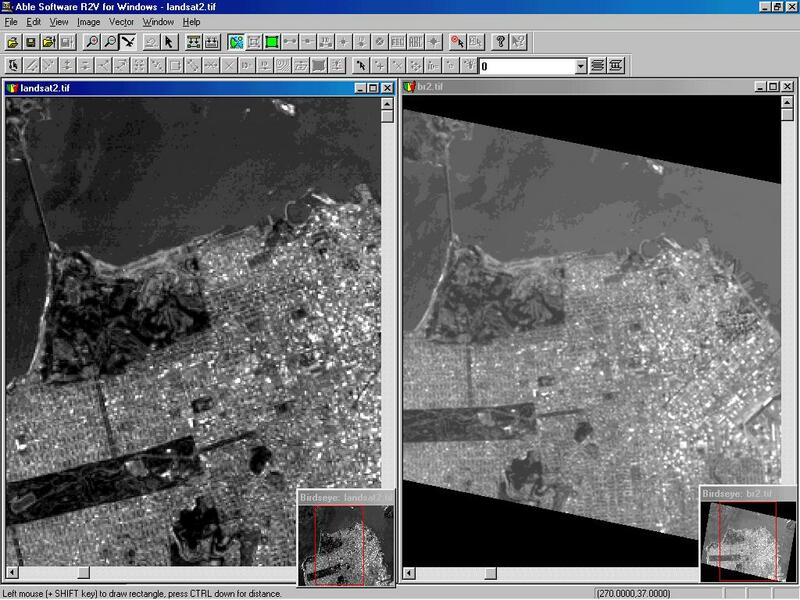 R2V supports most image types, including 1-bit bi-level, 8-bit grayscale, and color images (4-bit, 8-bit, and 24-bit). Most TIFF image compressions are supported. There is no software limit for image sizes. R2V also supports SPOT and other satellite raw image formats. Geo-reference your raster image in R2V and save to GeoTIFF format. Vector Export/Import: ArcView (Shape file), Arc/Info Generate, AutoCAD DXF, MapInfo (MIF/MID), IGES, MapGuide SDL, 3D Grid file, 3D DEM (compatible with USGS DEM), VRML, and 3D XYZ vector file formats. More vector file formats are being added. Click here to get sample output files. Fully automatic vectorization. One command will vectorize your scanned map in seconds or minutes at high quality. Batch function allows vectorizing a number of maps without any user intervention. Write your own batch script to customize the processing steps for the images before vectorization and for vector line processing after the vectorization. Interactive line tracing. You select two points on the image and let R2V trace the line for you. Easy, accurate and intelligent! For complex maps or drawings, use the interactive tracing to vectorize lines selectively. Or use the multiple line tracing function to vectorize a group of lines with only two clicks. Complete Vector Editing: A complete on-screen vector editor is provided using the image as a backdrop. Lines can be created, moved, joined, split, removed, colored, and labeled. Closed polygons are formed easily from existing lines with the polygon editing tool. Vector Rasterizing: Converts vector data to high resolution raster image for printing and processing. Multiple Layers: Use R2V's layer manager to define as many layers as needed to organize vectorized data into layers. Layers created in R2V are fully compatible with the export vector file formats that support multi-layer structure. With multiple layers defined, vector data can be processed, edited, and displayed by layer and moved between layers. Layers can be turned on, off, or locked for flexible vector data editing and handling. Point Feature Digitizing: Complete support for digitizing of point features. Points can be created, moved and labeled. Point data can be exported to all the vector file formats supported. Automatic Polygon Layer Creation: Create polygon layers automatically from vectorized lines with just one command. The closed polygons can then be edited, and labeled using R2V's line editor. Polygons can be displayed in fill mode with a user defined hatch pattern and color for the layer. Powerful Raster Image Editing: R2V provides a powerful raster drawing tool for easy image pixel editing and repairing. All image types, including 1-bit monochrome, grayscale, 8-bit color, and 24-bit color are supported by the Image Pixel Tool. Pixel mapping functions can easily map one pixel value to another for the entire image to remove noise pixels, clean up image background, or merge color layers. Geo-Referencing Using GeoTIFF or Control Points: Vector data can be geo-coded or geo-referenced to a real world coordinate system (e.g., UTM, Latitude/Longitude) using GeoTIFF, user selected control points or a World file (TFW). Raster images can be geo-referenced as well with a generated World file supported by ESRI's Arc/Info, ArcView, or TAB file by MapInfo. Image rubber sheeting functions allow geometric correction or registration of an image to a new coordinate system. R2V supports both Bi-linear and Delaunay triangulation methods for geometric transformation. Geo-referenced raster images can be saved in GeoTIFF format, and are fully compatible with other packages that support GeoTIFF. Conversion between Map Projection Systems: R2V supports conversion between UTM coordinate systems, latitude/longitude, State Plane NAD27 and State Plane NAD83 systems. You can convert one point or an entire set of control points automatically. Automatic Text Detection and Recognition (OCR): Detects and recognizes text of different fonts, sizes, and languages automatically. Flexible editor for easy removal and manipulation. Other irregular intersection symbols can be detected and corrected as well. Merge Multiple Maps: Use R2V to vectorize maps separately and then merge them into one set by specifying proper control points. The merged vector data set can then be edited within R2V and treated as a single map. Flexible Region of Interest for Vectorization and Image Processing: R2V supports regions of interest in the form of circles, rectangles, free form polygons, and their combinations for vectorization and image cropping. Powerful Image Processing: Vertical and horizontal flip, transpose, rotate, remove dark background, edge detection, image resample, crop a region, smoothing, segmentation, image mosaic, fusion, warping, and negate. Both supervised and unsupervised classification are built in to help process aerial photos or satellite imagery that are in color. Color separation, grayscale image enhancement, and image type conversions can all be done using R2V. 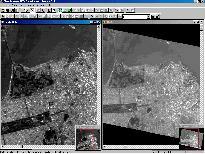 Image Mosaic: R2V's Image mosaic command makes it easy to create a mosaic image from a series of sub-sections. Simply start by selecting the Image/Mosaic option, and specify the layout matrix and image file names. The image mosaic will be created in a few seconds. Images with overlapped borders are correlated to create seamless image mosaic. Image Merge and Overlay: The image merge function allows you to combine multiple images interactively to create image overlays or mosaics. Copyright © 1994-. Able Software Corp. All Rights Reserved.